First, let me start off by saying that I’m a big fan of Land Rover, yes, before the stupid SUV craze and please don’t knock Land Rover for that, since that is all they have made for over 50 years. If you are going to be a SUV hater, hate Volvo, BMW, Porsche, Saab (the list go’s on and on) because they never had a SUV in their line — ever. 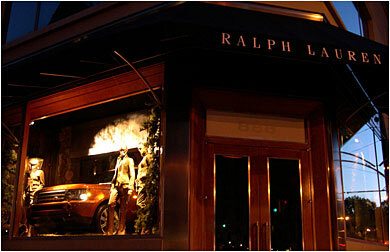 Ok, with that non-sense aside, you however can knock Land Rover for letting Ralph Lauren use a Sport in their “luxurious sporting lifestyle” window of the Ralph Lauren Sport store at 888 Madison Avenue in New York City. I understand that the brands might fit together nicely, but, come on, it’s very pretentious — over the top. I think Land Rover should go back to its roots, instead of doing these cheesy marketing deals they should go after the folks that understand what the brand is really about… but that’s just me… maybe they need the sales and this is the only way to get women dressed in clothing from the Ralph Lauren Alpine Collection, that love hanging out at the stable on a country estate, to buy a Land Rover.